This spontaneous roadside shrine for two University students killed by a drunk driver has been maintained since 2003. American roadsides are home to a vast range of impromptu memorials, some anonymous and modest crosses at the scene of a tragedy and others elaborate and well-maintained commemorations. Most of the markers on the shoulders of American streets commemorate the victims of an automobile accident, but there seem to be no especially systematic surveys of the geographical distribution, styles, composition, or duration of such markers. The phenomenon is not restricted to the US: In Australia, for instance, an astounding one in five auto accident fatalities is commemorated by a roadside memorial, and a thorough and fascinating catalogue of its roadside memorials reveals exceptionally complex markers and a diverse range of material commemorations; in the Ukraine, markers are traditionally placed at the site of tragedy and dot Ukrainian roadsides; and an ambitious French study by anthropologist Laetitia Nicolas inventoried markers and elements of roadside shrines throughout the country, with some thorough ethnographically researched studies of some shrines. While these memorials appear to have become much more common in the past few decades, the historical roots for such memorials extend well into the past, too, evoking the trailside burials left along arteries blazed by the earliest settlers into the American West. There is a series of compelling archaeological questions in these spontaneous shrines that reflect how we manage tragedy and loss and collectively approach public space. Anthropologist Sylvia Grider provides perhaps one of the most systematic analyses of such roadside shrines, placing roadside memorials within a continuum of spontaneous shrines at sites of everyday tragedy including auto fatalities, “ghost bikes” at cycling accident sites, and gun violence as well as the Oklahoma City bombing site, Ground Zero, and the site of the Columbine High School shootings. Some scholars attribute the recent explosion of roadside memorials and other spontaneous public shrines to the public mourning and ritual offerings that spontaneously began to appear at the Vietnam Veteran’s Memorial as soon as the Wall opened in 1982, all of which are collected by the Park Service. Grider interprets roadside memorials and comparable spontaneous shrines as folk art that has no especially clear guidelines, but there are certain common material elements, such as crosses, flowers, candles, and objects linked to the deceased or the event that are left at the site of the tragedy as ritual offerings. Shrines emerge spontaneously at the site of a tragedy, in many cases almost instantly: for instance, flowers, Batman memorabilia, and hand-written notes appeared at the site of the July shootings in Aurora Colorado by the following morning. Grider is one of a handful of scholars who provide us a rich starting point for such research: Jack Santino approaches these shrines as commemorative mechanisms placed in the public landscape that often invoke genuine social activism; Laetitia Nicolas’ thesis provides a rigorous study of French examples from the Alpes de Haute-Province; Art Jipson has conducted interviews with a wide range of people who erected such memorials (compare his powerpoint on the project); and photographer Lloyd Wolf has documented a host of Washington D.C. memorials to the victims of violence. Yet much of what we know about these shrines as material culture is relatively impressionistic and would never satisfy an archaeologist as a rigorous material analysis. For instance, we do not have particularly systematic inventories of the sorts of things that appear in shrines; the frequency of such markers is not clearly mapped; their size and spatial arrangement remains undefined; the duration of the shrines varies widely; the geographic and cultural distinctions in patterns are unclear; and the ethnographic complexities of why particular people erect shrines remains only impressionistically documented. A narrative on roadside memorials based on such rigorously analyzed material patterns would almost certainly tell distinctive stories about society and grief. The vast majority of roadside shrines and memorials are testaments to auto accidents, and perhaps in some eyes these memorials are cautionary tales about the dangers of the road. Jack Santino, for example, sees spontaneous shrines as public political statements illuminating a concrete social ill, with roadside memorials often speaking against drunk driving. In most cases, though, these shrines are fundamentally efforts to simply manage incomprehensible tragedy. In his interviews with 309 individuals who contributed to 127 memorials, Art Jipson found that 95% of shrines are erected by family members, and 80% were erected by women; interestingly, every single person he interviewed believed that the shrine site was more significant than the gravesite itself. Roadside shrines spring up when people are trying to memorialize a loved one lost in the sudden and unexpected tragedy of an auto accident, often aspiring to commemorate someone lost in the midst of youth whose life may risk being forgotten. These fatalities are what might be loosely termed “bad” deaths, tragedies that we negotiate publicly through material shrines. Many are anonymous, simple crosses that borrow a horizontal surface—like a sign post, guardrails, or fenceline—outside lawn mowers’ reach. Others are exceptionally complex installations that grow over time and are well-maintained. At least one firm manufactures crosses specifically for use as roadside memorials, but in the thousands of online pictures of roadside shrines nearly all appear to be homemade. The inscribed plaque placed at the DJ Rahn and Carrie Coleglazier roadside memorial in Indianapolis. Their appearance in public space has led some communities to attempt to control spontaneous shrines. An Akron, Ohio law decrees that memorials must be removed within 45 days; South Carolina erects official roadside memorial signs, as does Wyoming, and Illinois has a DUI Memorial Sign program; and various communities are debating removing these shrines entirely and joining the 15 states that outlaw them entirely (see Art Jipson’s 2007 review of all American state codes on roadside memorials). The most common argument against the shrines is that they are distractions on public roadways, violating public property law and simultaneously triggering new accidents (though there appears to be no evidence indicating that any wrecks have been caused by roadside shrines or by pedestrians erecting them). Few governments have addressed such memorials as extensions of Christian symbols to public property, and it would be interesting to identify some American memorials that incorporate non-Christian symbols. The persistence of many unmaintained shrines (as well as those that are regularly visited) suggests that there is a largely unspoken recognition of the significance of these spaces and material offerings that most of us are disinclined to contest. State and local governments may aspire to control such relatively spontaneous folk offerings, but it is very unlikely they can do more than remove existing shrines and create significant tension among survivors. In many cases, survivors simply erect new memorials in the wake of their dismantling. 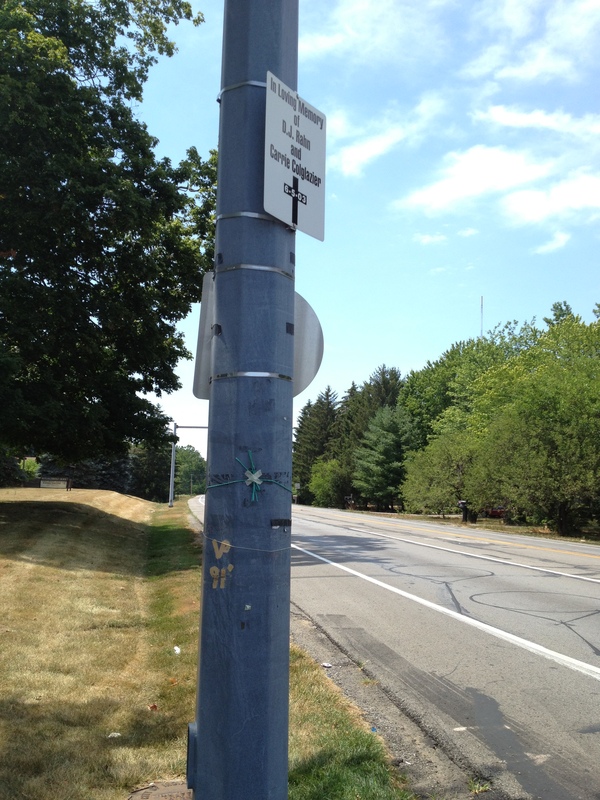 The light pole neighboring their 2003 accident scene holds a sign commemorating DJ Rahn and Carrie Coleglazier. My home state of Indiana is one of those 15 states that has outlawed roadside shrines, but the streets are dotted with a vast range of typical roadside memorials revealing the difference between law and everyday practice. Nearly each day, for instance, I pass a prominent memorial to two Butler University students, DJ Rahn and Carrie Colglazier, who in June, 2003 were on a motorcycle that was hit by a drunk driver. Nine years later the intersection still has two modest crosses erected beneath a tree (on a lot owned by a church, which appears to dutifully mow around the crosses), with a modest stone plaque in the ground, a cluster of flowers, and a sign affixed to the neighboring light pole. 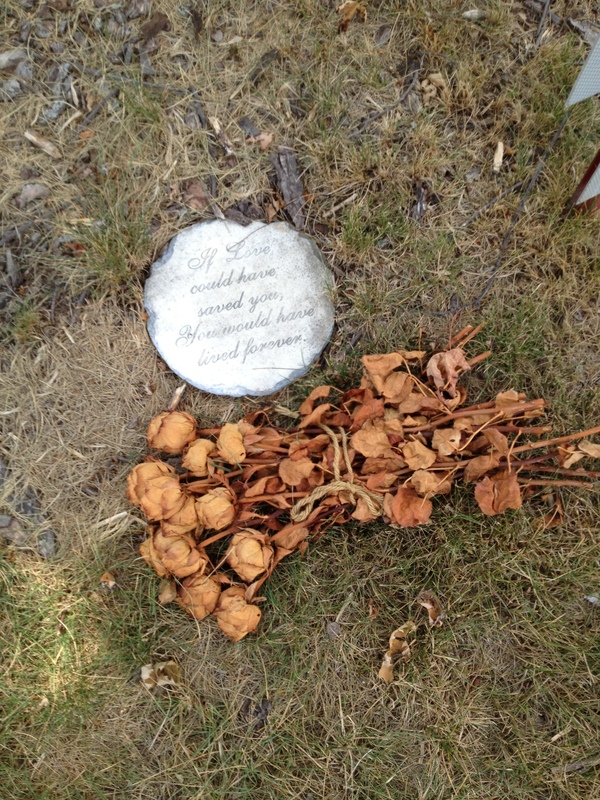 What was once a spontaneous shrine might now be termed a genuine permanent memorial, since it appears well-maintained and presently has a flower bouquet that has dried in the midst of a steaming Midwestern summer. 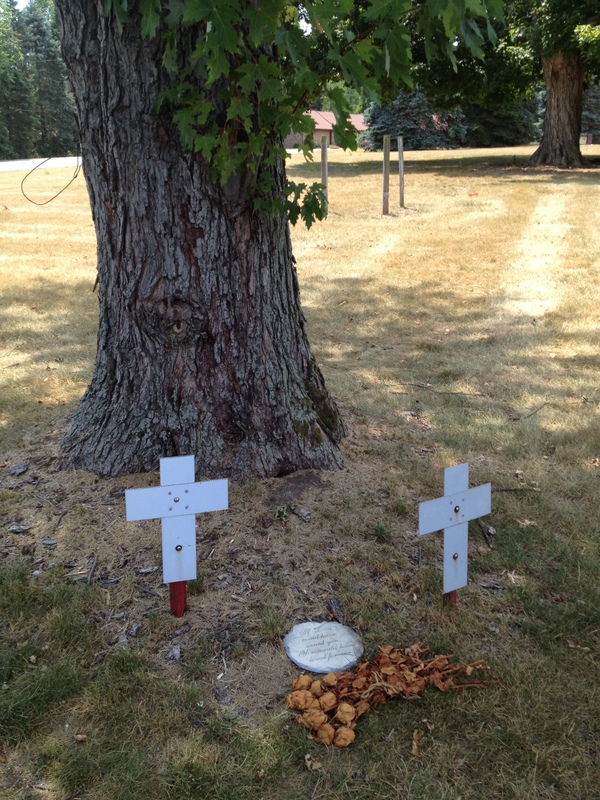 The small stone plaque resting between the two crosses is inscribed “If love could have saved you, You would have lived forever,” and the sign on the light pole reads “In loving memory of D.J. Rahn and Carrie Colglazier 6/5/03.” Aesthetically, the shrine is relatively typical, with crosses as the centerpiece of the physical display with a modest memorial addition (in this case the stone plaque, much like angel figurines found on many roadside shrines). The memorial has no reference to Rahn and Coleglazier’s deaths at the hands of a drunk driver, but the visible and public memorial minimally evokes their tragic deaths at the corner. Perhaps most important is not that survivors maintain the memorial but rather that the community willingly allows it to remain in public space and implicitly respect the victims’ memory and survivors’ grief. Even people who may find such shrines unsettling, illegal, or unsightly seem very reluctant to remove the shrines and risk appearing to minimize those memories or grief. For more on the subject, start with Sylvia Grider’s paper Spontaneous Shrines: A Modern Response to Tragedy and Disaster (New Directions in Folklore 2001). The Ukraine research was conducted by folklore scholar Svitlana Kukharenko and is detailed in her 2010 dissertation Abnormal Death Rituals in Ukraine: The Folkloristic Perspective (University of Alberta). Those with JSTOR subscription access should read Jack Santino’s 2004 Performative Commemoratives, the Personal and the Public: Spontaneous Shrines, Emergent Ritual, and the Field of Folklore (The Journal of American Folklore 117:363-372). For a broader take on difficult memories and space, I highly recommend Kenneth Foote‘s book Shadowed Ground: America’s Landscapes of Violence and Tragedy (University of Texas, 2003). Another fascinating and thoughtful analysis of perception and materiality is Marita Sturken’s Tourists of History: Memory, Kitsch, and Consumerism From Oklahoma City to Ground Zero (Duke, 2007). Another fine study is Holly J. Everett’s Roadside Crosses in Contemporary Memorial Culture (Texas 2002). Today the 99th annual Tour de France begins its second of three weeks that traverse 2173 miles of France and its neighbors. A pro cycling race is not quite the same experience as everyday cycling, but both are distinctive material experiences shaped by an interesting fusion of aesthetics, spatiality, motion, place, sound, body, and commodities, and they might just provide us an example of how to think about archaeological materiality in broad and ambitious terms. One approach to analyzing the Tour de France or cycling in general would be to assess all its effects. For instance, at an economic level alone the impact of cycling is enormous: In the UK, for instance, 3.7 million bikes were sold in 2010 alone alongside 853 million Pounds of accessories (i.e., 1.3 billion dollars). The National Bicycle Dealer’s Association estimated that in 2011 the American cycling industry was worth $11 billion and included the sale of 15.7 million bikes. Like all professional sport, the Tour de France is fundamentally an advertisement for the companies that sponsor professional cycling teams (e.g., the British TV station Team Sky leads the team competition as of today), the communities that host stages of the race (e.g., the ski town of La Planche des Belles Filles on July 7th), and a broad range of branded cycling commodities (e.g., staple American bike shop brands Specialized, Trek, Giant, and Cannondale all are ridden by Tour teams, and every possible accessory from sunglasses to shoes to helmets are relentlessly branded and marketed). Many of these team brands do not have all that much cachet (let alone name recognition) in the US outside cycling circles—after all, how many Americans have strong feelings about Rabobank, Saxo Bank/Tinkoff Bank, or Francais des Jeux? The most visible American team this year is Garmin-Sharp, but certainly the universe of companies manufacturing cycling accessories for the Tour recognize that the US is one of their most important markets. 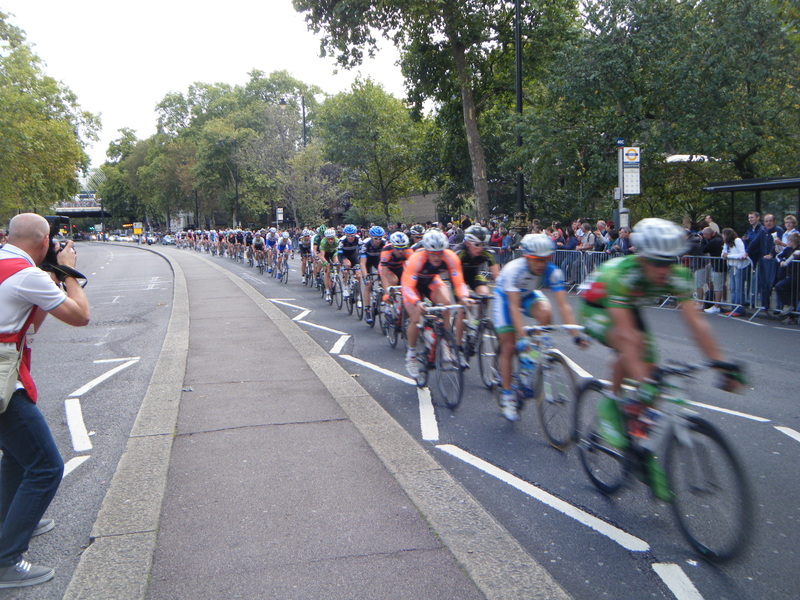 The peloton whizzes by in the 2011 Tour of Britain in London. Nevertheless, the fascinating material experience of a bike race in particular and cycling in general are often overlooked. A cycling peloton (i.e., the group of cyclists) has a very distinctive material presence combining sight, sound, and physical sensation. A peloton is a panoply of colors in large part because every rider is a moving billboard, much like race cars, so a passing peloton is a striking rainbow whizzing by at 25 miles an hour or more. Races like the Tour de France are of course tourism advertisements as well, so they pass through absurdly beautiful landscapes like the sunflower fields in France or the Tour of Britain’s London stage that heighten the aesthetics of the peloton and play especially well on television. Archaeologists rarely address the relationship between sound and materiality, but the peloton rainbow has a very distinctive acoustics of rapidly spinning wheels and gears (followed by the trailing caravan of support vehicles) that reverberates uniquely in different spaces (e.g., races in cities sound much different than those in open spaces), and a massive peloton sounds different than a long single line. Along with that color and sound comes a powerful physical feeling of wind in the wake of a peloton passing, yet even one rapid bike creates a surprisingly strong gust of breeze. And of course part of the material spectacle of cycling is the pure sensation of speed that is especially impressive for a motionless person standing at roadside. Try to identify your favorite brand as it flies by in a 35-mph rainbow. Start and finish lines are peopled by a vast caravan of colorful support vehicles that carry bikes and a host of support personnel, and those spaces offer one of the few places fans can actually see a bike and rider for more than a few instants. 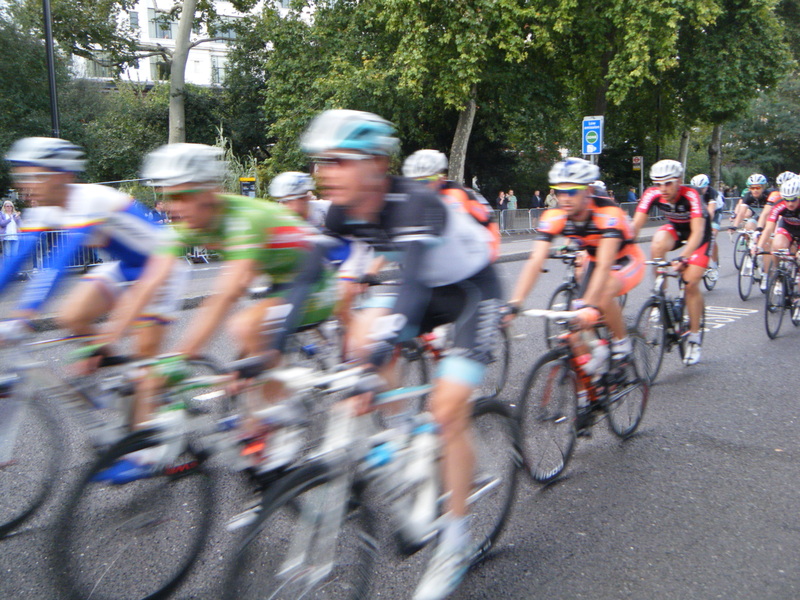 In the Tour, for example, fans can camp out for days to literally see a peloton pass by within less than a minute, though a caravan of vehicles pass by ahead of the riders circulating freebies for patient fans. Cyclists spend vast hours in the saddle each day, and along the way they eat an enormous amount of food and drink gallons of fluid, leaving behind a wake of food wrappers, empty bottles, and assorted debitage that gets snapped up by fans. These roadside spots and the start and finish lines become social spaces as fans mill about awaiting the bike race itself, and in many races the start and finish lines become places to purchase a universe of branded goods. One material thing emphasized by these start and finish line areas is the bodies of cyclists themselves, which are for the most part not really discernible in a peloton (see Brian Gilley’s analysis of cyclists’ bodily subjectivity). Like all professional athletes, cyclists are genetic anomalies, and lifetimes of riding maximize their strength-to-weight ratio by providing them with strikingly thin bodies and relatively big thighs that are further crafted based on whether an individual cyclist is a specialized climber, sprinter, or all-around rider. This is all especially clear when cyclists are moving about in the same space as normally proportioned fans. The miracle of bib shorts and bike clothes can compress many typical bodies into something loosely approximating a professional cyclist’s body, but short of genetic manipulation most of us can never approach the physical form that is typical in the pro peleton. Nevertheless, even a recreational rider will probably get a little lean, and they almost certainly will develop a distinctive cyclist’s tan beginning at mid-thigh to sock line, extending from short-sleeves to wrist (i.e., between jersey and gloves), and leaving a bright temple and cheek halo around sunglass frames. 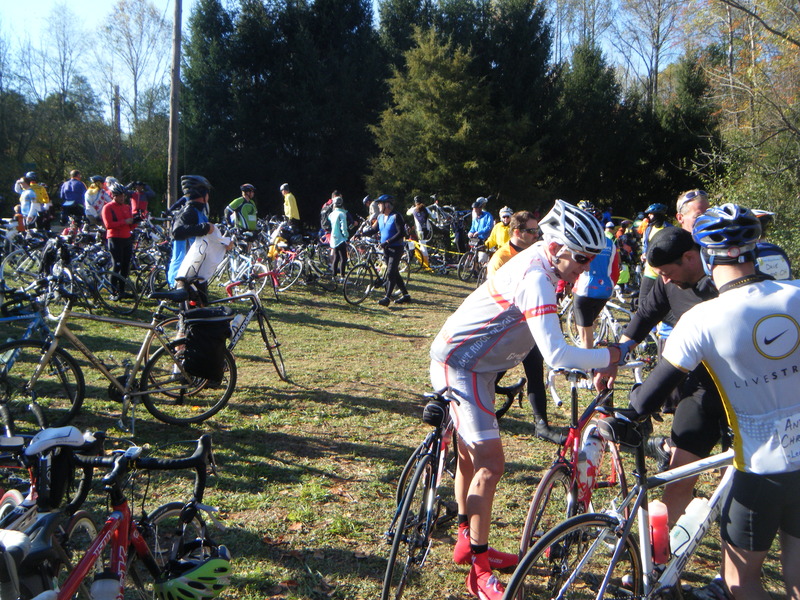 Even club rides like the 2011 Hilly Hundred in Bloomington, Indiana includes scores of cyclists in professional and branded garb. The aesthetics of a pro peloton are mirrored in many local bike shops lined with an ever-expanding universe of visually striking jerseys, and nearly any club ride or weekend ride will include many of the same jerseys found in the pro peloton. What the local bike shop will also confirm is that cycling is accessory-rich: Beyond the universe of pedals, rims, and parts that can update or improve any given bike, a well-equipped bike can include bike computers, lights, bags, bottles, and an astounding breadth of clothes. And anybody whose only bike-purchasing experience was in a department store will be stunned to find a universe of bikes for nearly every conceivable kind of riding and body type, with time trial bikes, mountain bikes, road bikes, “hybrid” bikes for commuting, and a host of other bikes distinguished by frame materials, size, and myriad details. The pro cycling peloton is not a piece of traditional archaeological data, but then relatively few pieces of contemporary material culture conform to facile definitions of archaeological materiality. Rethinking how the experience of cycling encompasses sound, vision, space, motion, and something beyond bike frames and narrowly defined things provides one more mechanism to help us re-think how to look at materiality in broader terms in the past.